The title of this post really says it all, doesn’t it? Navy. Eyelet. Pom Pom. Jumpsuit. What’s not to love?! If I’m being honest, for me it was initially the “jumpsuit” part. I think my height (5’2″) has kept me away from the jumpsuit trend we’ve seen over the past few months. For some reason, I’ve been so intimidated by it! I think it also comes down to the actual jumpsuit designs I’ve seen. I’ve seen a couple of cute, well-done ones, I really haven’t cared for the majority I’ve seen. That is until I came across the perfectly put-together jumpsuit of my dreams… this beauty. 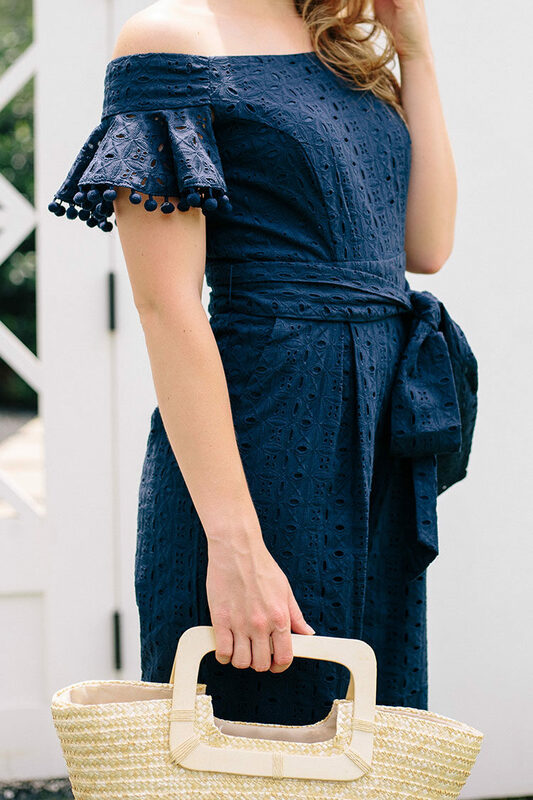 Not only is it comprised of classic, darling details (I love anything eyelet, and those pom poms? I mean, come on!) but it also comes in petite sizes as well as regular! I finally gathered up my courage and ordered it. The 2 Petite gave me the proportions needed for a perfect fit, and now that I’ve found one that fits, I’m obsessed with the jumpsuit trend! How about you? 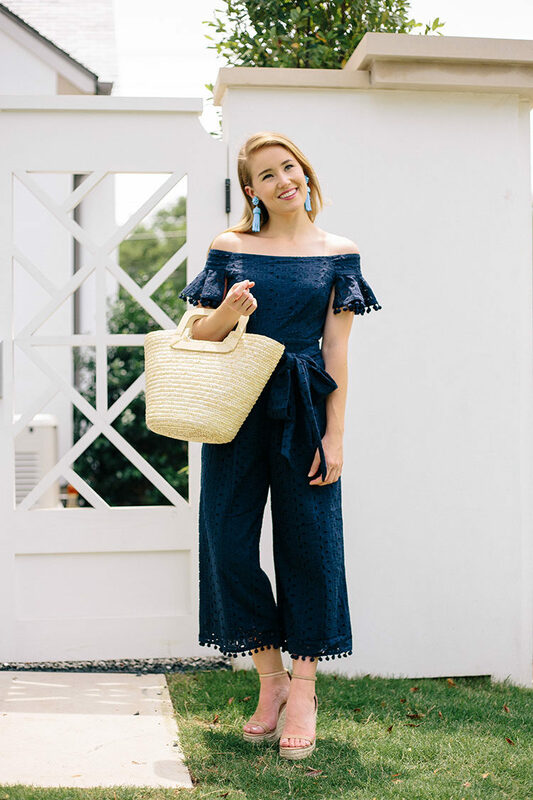 Do you love the jumpsuit or is it not for you? I’m generally not a jumpsuit person, but I really love this one! I think the eyelet and the off the shoulder silhouette makes it look really polished and not like a sleeveless parachute uniform. I love the fridge too! Original, beautiful and super elegant jumpsuit! And the wedges are perfect to go with it! Not normally a jumpsuit type gal, but this one looks great! I love jumpsuits when I see other people wearing them but have been too nervous to try one on myself. I keep telling myself to just go for it! I love this one!! This is adorable! 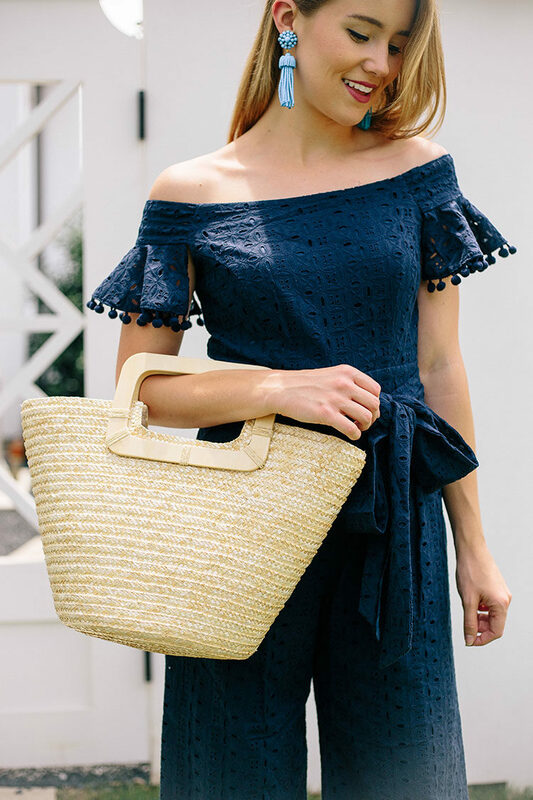 Love the navy paired with your cute blue earrings. I love that jumpsuit! It looks so good on! The pom poms are the best part! This jumpsuit is so cute! I’m really short too and I have always been a little nervous about trying jumpsuits but I should try this one! A petite romper!! It’s adorable! That’s a great idea and also something I rarely seen done! They also need to have rompers come in tall because the shorts are always wayyyyy to short on me.